An intricate piece of hand embroidery, using stem stitch, chain stitch, long and short stitch, and satin stitch. Base fabric used: sky blue colored, thick casement. This design always reminds me of books like Pride and Prejudice, Sense and Sensibility, Wuthering Heights, Gone With The Wind and Jane Eyre. It has a kind of Victorian feel to it, don't you think? Anyway, it's always been one of my favorite works in the collection under 'people'. 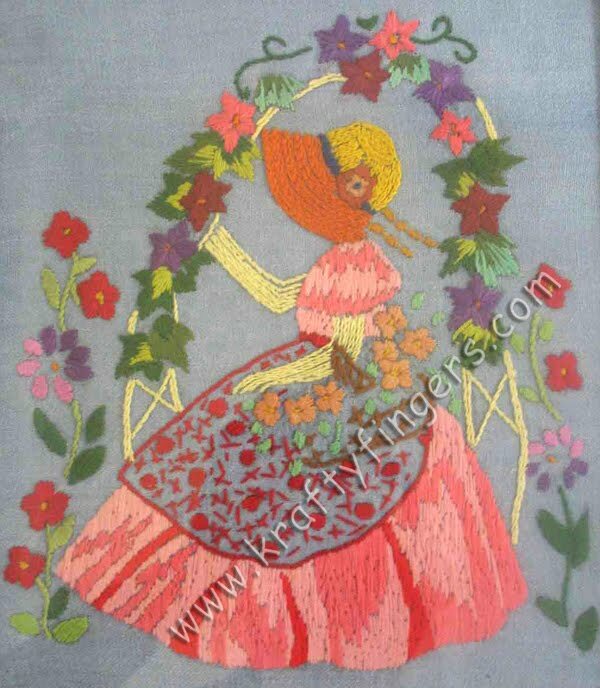 This "Lady In Garden" embroidered Wall Art is a part of the "Limited Edition Collection" here. Please order immediately if you are interested in this product.